I want to begin this post by saying that I have been so fortunate to have some of the best firearms training in the country. Arrowhead Firearms Training in Victoria, TX has given me a strong platform from which to propel me from fundamentals to finding my own shooting style. Because of their dedication to beginners and women shooters, I felt I was ready to tackle the next rung on the ladder... shooting in disruptive environments. Along with my husband, I have taken fundamental handgun classes with Travis in the past, and his unique ability to apply science, biomechanics, and logic to the basics of handgun manipulation and shooting have helped me to progress in my three short years of shooting. Part of the reason is that he pushes you to your failure points; he teaches you to self-diagnose and self-correct so that you can continue to train on your own. Another reason that his classes excel above all others is that you get to know yourself better, both as a shooter and a person. It's hard to explain, but Travis makes you want to surpass your limitations, whatever they may be --- and to do it for you, not to please him. So let's get down to the specifics of this class. Disruptive Environments:Handgun/Vehicle/Darkness was three days of using critical thinking skills, along with honing weapons manipulation skills and applying them to not only changing positions while shooting; but shooting inside and outside of a car, both during the day, low-light situations and at night; and with and without flashlights. Let's just say that very few people in the class had trained with all these goals in mind. Under these circumstances, it wasn't hard to recognize your failure points... lots of failure points. Some of them involved equipment. We quickly learned which flashlights were user-friendly in a tactical situation. Failure points also came in terms of abilities to search, identify, adapt and move when confronted with a threat. This class helps you move beyond static shooting and assumes you know how to effectively manage your firearm. Your brain is required to work in a completely different manner. How are you going to react with flashing lights in your peripheral vision? How will you respond when people are shouting and shots are being fired all around you? It is no longer a matter of focusing only on your pistol and proper manipulation, but how to continue to do that while your brain is distracted with secondary stimuli. I quickly realized that I will have to train to use more of my brain to stay tuned in to my surroundings and the changing environment. Our class was filled with a wide variety of shooters. There were federal agents who were trainers themselves; Grand Master match shooters, Special Operations soldiers, law enforcement officers, and civilians. No matter what your level of expertise, or your number of years of shooting, we all found our failure points. It was interesting to see that even those who shoot for a living have something to learn. And if you can't let go of your pride, then learning from those failure points will be harder to accomplish. Everyone is there to reach a failure point and to advance their skills. As my husband, whose name literally means Peace-Loving Warrior, often reminds me, "It's better to be the little fish, surrounded by the big fish. You learn more that way." One thing I want to make clear: I don't want to discourage anyone from taking this class. Even if you are new to shooting, like me, you will gain so much from being willing to be in an uncomfortable environment in order to learn. Don't be intimidated by the calibre of shooters around you. And my brain is so full of all that I learned. Personally, this class was physically difficult for me. I was the oldest in the class and the one with the least experience... but no excuses; my failure points were epic and evident. But I signed up for the class, knowing it would be challenging, and wanting to push myself. If I was going to be able to effectively defend myself in any situation, I had to put myself out there and fail. And I did. But I also knew that Travis Haley is the best at helping me find those failure points and showing me how to overcome them. And he did. But I can't lie; the first morning after the class, when I pulled my exhausted body and mind from the shadows of sleep, I spent about an hour crying. I was embarrassed over some of the mistakes I had made, and disappointed in my performance. I knew I would have to work out some problems; it just seemed like there were so many. As I sat in silence, collecting my thoughts, my husband asked, "What are you thinking?" I looked at him, and through swollen eyes, I said, "I want to start preparing right now for next year's class, and take Disruptive Environments: Handgun/Vehicle/Darkness again." And that, my friends, is why I continue to train with Travis Haley. He challenges you to inspire yourself. He helps you find your failure points so you can become a better you. I have bought my Bosu ball to begin perfecting my balance and conditioning, and I have an appointment tomorrow to begin rehabbing my knees to gain the flexibility and strength I need to run, drop to a knee and move quickly to a new position. I may no longer be "a spring chicken", as Travis so delicately reminded me, but that doesn't mean I won't come back next year stronger, more determined, and with increased effectiveness. I know what I have to work on physically and in my training, and I will spend the next year doing what I have to do to fix my failure points ... and ready to have him show me new ones. Thank you, Travis! Philippians 3:13 "Brothers, I do not consider that I have made it my own. But one thing I do: forgetting what lies behind and straining forward to what lies ahead..."
Hats off to Travis Haley! This country needs a million more! It is crucial that we prepare, our enemy is... The Oathkeepers announced a training program at the beginning of March, to start preparing communities for a coming disaster. They are asking all state leaders to implement it in all states. 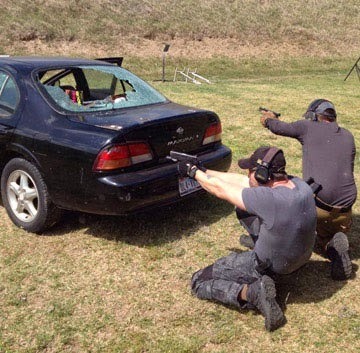 The average citizen has little or no access to this type of training that is so vitally important! Bellringer, look at your failures as a trophy! You are much better prepared than the average citizen! This puts you in the top 2 or 3 percent of the US! Wheather you realize it or not, you will be a leader for so many people around you who have no idea what to do in a critical situation. God uses whom he will. I just wonder how many would even consider, if it were even available and free, to take a course like you did? Very, very few would be my guess. Hats off to you! You stood up! We Christians fail every day. It is the failures that make us better, stand strong, I salute you! This troubled nation needs millions more "failures" just like you! I don't see myself as any more brave or strong than many Americans who will stand when it is time. And I want to emphasize the reason Travis teaches this course and that I took it ... we all have a responsibility to protect ourselves and our loved ones if presented with a carjacking, home invasion or other chaotic situation. Travis constantly preaches "Thinkers before Shooters", so I will try to de-escalate any situation that I can, and try to be part of the solution, rather than contributing to unnecessary violence. That being said, I also want to be able to adequately protect myself when presented with a life and death situation. Finding those failure points, and then training to correct them will give me a chance at success. And above all else, I will rely on God to guide me in all my actions. Your growth is not a bi-product of my teachings because I cannot teach you... I can only help you to explore yourself and to believe in yourself nothing more. Your growth can only be a bi-product of you because you now believe in the impossible... and as you know in my world everything is possible. I am also a believer in: Although God will always be on overwatch, it doesn't mean he wants the responsibility to guide you in all your actions... Thats is your job that he expects and tests. Your God's responsibility is the praise and reward at the end of your life-path after doing more than is required of you. First of all, you give me too much credit for my accomplishments apart from the knowledge you have given me. Because of my index style of learning, many trainers would have thrown up their hands -- you didn't. Your love of training, your real desire to help people, and your never-ending pursuit of knowledge all meld together to create an environment in which I can take your instruction, find my failure points and build toward success. I will never be able to adequately thank you for that. And I agree with you on my responsibility to do the work that God expects of me. But I'm also not so proud that I think I can do it all on my own. You're right, nothing is impossible. I just know that when I am at the limit of my human abilities, I find that I must rest on a spiritual ability. I hear your frustration ; I, too, am tired of all things doctrine, religion and denomination. But, probably like you, I find the God who searches for me. I try not to get caught up in the ecumenicalism that is so rampant today, but listen to the God that gives me my talents and directs my path. You and I are not that far apart on what we seek. And I am grateful that my path has crossed yours. P.S. Today, I start my first day of rehab on my knees! Looking forward to D3 (part Deux) next year!